A Better Way to Replace Compression Stop Valves. The only stop valve that installs over the old brass ferrule. Can also be installed on clean pipe. Simplify! Just push the patented ACCOR R-SERIES over old brass ferrule. Eliminates the need to remove old ferrule which can cause pipe damage. No need to re-use the old valve nut left behind the ferrule. 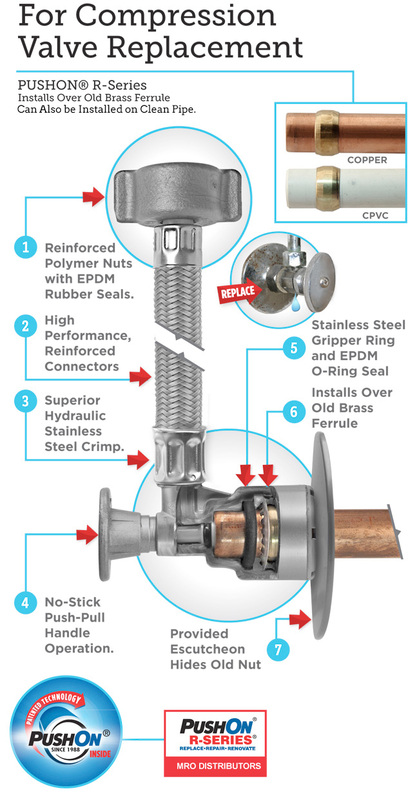 Eliminates expensive in-wall pipe stubout replacements. Best of all, rely on a 10-year limited warranty for residential construction that includes labor.